A complex combination of gardenia, rose, violet, ylang ylang floral fragrances and heart notes of mimosa, cinnamon, pine, musk and amber. The Orchidaceae are a diverse and widespread family of flowering plants with blooms that are often colorful and often fragrant, commonly known as the orchid family. 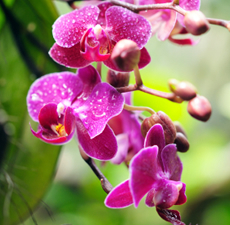 The scent of orchids is frequently analyzed by perfumers (using headspace technology and gas-liquid chromatography) to identify potential fragrance chemicals. The other important use of orchids is their cultivation for the enjoyment of the flowers. Most cultivated orchids are tropical or subtropical, but quite a few which grow in colder climates can be found on the market. Orchids have been used in traditional medicine in an effort to treat many diseases and ailments. They have been used as a source of herbal remedies in China since 2800 BC. Orchids have many associations with symbolic values. For example, the orchid is the City Flower of Shaoxing, China.